The new CEO of BMW, Harald Krüger, took the stage Tuesday morning at the 2015 International Motor Show in Frankfurt to talk about the latest offerings from the BMW Group, as well as the company’s commitment to electric cars. Unfortunately, that is not the reason the news conference will be remembered. About five minutes into the presentation, Krüger stumbled and collapsed onto his back. He started to sit up and rub the back of his head as BMW staff ran to help him onto his feet and get him offstage. As he was looking around, it seemed as if Krüger was confused and disoriented. 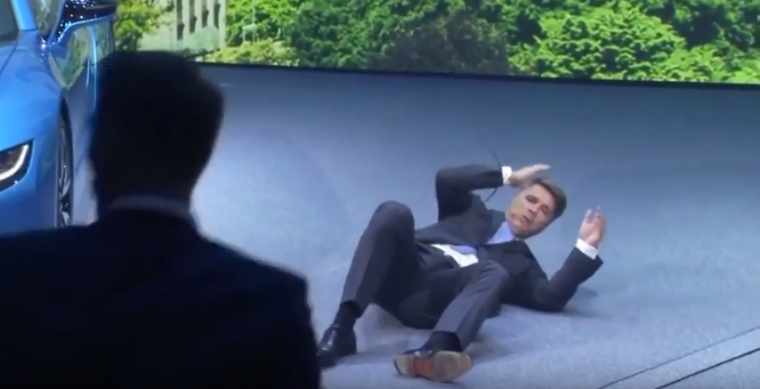 BMW Spokesman Maximilian Schoeberl later addressed the press and said that a doctor had seen Krüger and sent him home to rest after his dizzy spell. Krüger had recently returned from extensive travel overseas, and did not feel well this morning but decided to go ahead with the presentation. A history of circulation problems could also be to blame for the fainting incident. BMW cancelled the remainder of the presentation, and the automaker will attempt to redo it later on in the show. Krüger was scheduled to participate in a roundtable with journalists later in the day, but he was represented by BMW’s CFO so that it could take place as scheduled.